# or "npm i puppeteer"
Note: When you install Puppeteer, it downloads a recent version of Chromium (~71Mb Mac, ~90Mb Linux, ~110Mb Win) that is guaranteed to work with the API. Puppeteer will be familiar to using other browser testing frameworks. You create an instance of Browser, open pages, and then manipulate them with Puppeteer's API. Explore the API documentation and examples to learn more. Puppeteer bundles Chromium to ensure that the latest features it uses are guaranteed to be available. As the DevTools protocol and browser improve over time, Puppeteer will be updated to depend on newer versions of Chromium. Q: What is the difference between Puppeteer, Selenium / WebDriver, and PhantomJS? Selenium / WebDriver is a well-established cross-browser API that is useful for testing cross-browser support. Puppeteer works only with Chrome. However, many teams only run unit tests with a single browser (e.g. PhantomJS). 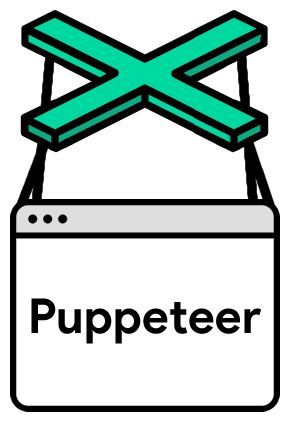 In non-testing use cases, Puppeteer provides a powerful but simple API because it's only targeting one browser that enables you to rapidly develop automation scripts. Puppeteer uses the latest versions of Chromium. Q: Why is the Chrome team building Puppeteer? Q: How does Puppeteer compare with other headless Chrome projects? The past few months have brought several new libraries for automating headless Chrome. As the team authoring the underlying DevTools Protocol, we're excited to witness and support this flourishing ecosystem. We've reached out to a number of these projects to see if there are opportunities for collaboration, and we're happy to do what we can to help.